Thawan Duchanee: Baandam Musem or "Black House"
Chalermchai Kositpipat: Wat Rong Kung or "White Temple"
Putha Kabkaew: Wat Rong Seur Ten or "Blue Temple"
All of these temples are a must see to understand how ancient Buddhist philosophy are being reinvented with modern thought and construction. 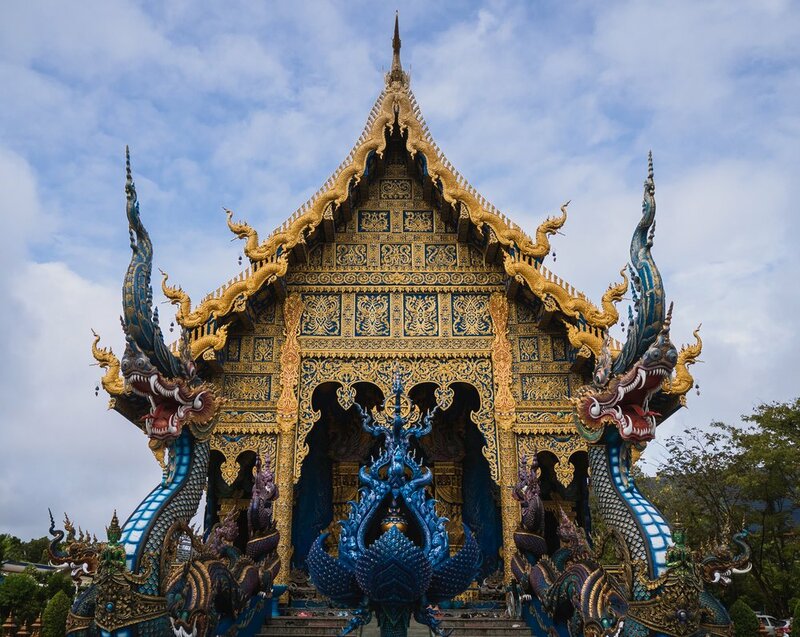 Who's ready to see Chiang Rai's most famous modern temples? Let's get started. The Baandam museum also known as the "Black Temple" is technically not a temple. The Baandam museum is a contemporary home and art collection curated by Thawan Duchanee to represent a modern take on Buddhist hell, destruction, and war. The collection features unorthodox (some may say unnerving) Thai architecture twisted with animal skins, skeletons, and phallic symbols. Duchanee built his home in traditional Lanna architecture, painted it all black, and filled it with animal skins, bones, and tribal art. Originally, the public frowned upon his work and in the 1970s zealous Buddhists vandalized his home. The public accepted and embraced his vision after he was named a National Artist in 2001.. After his death in 2014, the estate was donated to the city of Chiang Rai as a public museum. As you walk around the estate and gardens, it's easy to feel as if you stumbled into a fantasy warlord video game. Rooms are set up to look like a war council room and ritual chambers. You can find bone weapons throughout the collection. Though it's easy to get caught up in the artist's cynicism you can also see Duchanee's humor - phallic symbols and penises are scattered throughout the complex. We couldn't help but giggle. The Baandam Museum is seven miles north of Chiang Rai's city center. You can take a songthaew or taxi for 70-80 baht to the house. Getting back may be tricky due to the lack of transportation surrounding the area. You can ask your songthaew driver for "there and back" which should cost between 150 - 170 baht. We recommend coupling the Baandam with the Blue Temple since they are only 20 minutes apart by car. The most famous temple in Northern Thailand is Wat Rong Khun. A glistening white cosmic portrayal of a wat. Was it sent from an afar alien planet? We think so because it is out of this world! The architect Chalermchai Kositpipat, the student of Thawan Duchanee, envisioned a modern temple to embody the Buddhist cycle of rebirth. Construction began in 1997 and is still ongoing. Chalermchai has grand plans for the complex including a chedi and viharn which should take approximately 70 more years to finish. The completed temple is an all-white mirrored alternative to traditional colorful Buddhist temples. The white symbolizing the purity of Buddha and the mirrors his wisdom. You begin your journey to the temple walking past hell - you will see greedy hands grasping for wealth and human skeletons tortured by venomous snakes or demons. As you walk over the "cycle of rebirth" bridge, you symbolically end the cycle of suffering and enter into Buddhist heaven. Inside the temple is a modern psychedelic take on suffering and nirvana. Gaudy colors portray human tragedy during death and war with modern cartoon characters such as Pikachu, Bumblebee, Angry Birds, and Darth Vader intermingled in the destruction. Is Kositpipat trying to say modern pop culture and media is a root of suffering? Perhaps so. The white temple south of Chiang Rai's city center east of highway 1. You can take a 30-minute songthaew or taxi ride for 50-60 baht from the city center. Iridescent shades of blue, turquoise, green, and purple paint Wat Rong Seur Ten. The temple's color scheme symbolizes the dharma, a set of Buddhist morals including wisdom and purity. Inside the viharn is a trippy, kaleidoscope depiction of Buddha's spiritual journey. A white buddha sitting in the earth mudra represents the moment he reached nirvana. The temple is up and coming. Crowds will be smaller than the White Temple, but are sure to grow as the wat’s surrounding artwork is completed. The temple's name translates to "House of Dancing Tiger" since the viharn sits on a temple ruin site where tigers would freely roam. The town decided to renovate the temple in 1996, started the viharn's construction in 2005, and completed the temple in 2016. Development around the temple is led by Putha Kabkaew. Kabkaew is the student of Kositpipat, the famous White Temple's architect. Thus, the Blue Temple’s design is similar to its big sister. 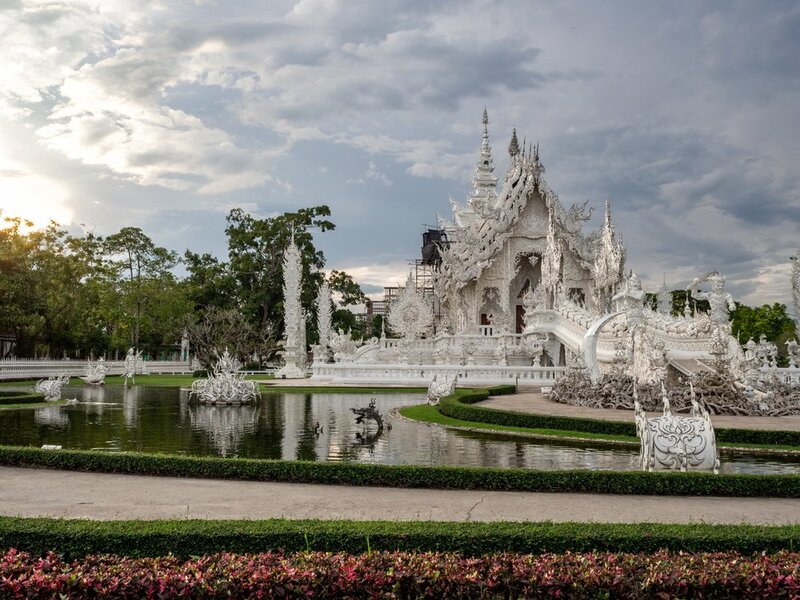 Wat Rong Seur is located north of Chiang Rai west to highway 1 and just north of the Kok River. You can either take a songthaew or taxi to the wat from the city center for 70-80 baht. We suggest coupling a trip to Wat Rong Seur Ten with a trip to the Baandam museum since they are in the same area. Chiang Rai is a hub for eclectic thinkers and modern artists. Three must-see temples proudly display the city's fresh take on Buddhist philosophy and architecture - Baandan House, Wat Rong Kung, and Wat Rong Seur Ten. As the temples continuously evolve to keep up with modern interpretations of Thai culture, their unusual allure nature will land them on more traveler’s bucket lists. What do you think about the modern art revolution represented in the White, Black, and Blue temples in Chiang Rai? Do you think culture should stay fast to tradition or mix it up a little? Feeling temple burn out? Try a jungle excursion to Fang Hotsprings! Headed to Chiang Mai? You must visit these top five temples. Not quite sure what to wear to temples? Read our Guide to Thailand for temple etiquette.